Tarpon guides understand that although Captiva Island is known as the little sister to Sanibel Island, there is nothing little about Captiva Island’s tarpon fishing! Captiva is home to some of the world’s finest back country and inshore, Florida flats fishing for tarpon, snook, redfish, snapper, speckled trout, mackerel, grouper, black drum, shark, and more. Captiva Island, sought after fishing destination, is located along the pristine Gulf Coast just north of Sanibel Island along Pine Island Sound, and just south of Boca Grande Pass-world famous for its legendary tarpon fishing. The tarpon fishing in this area is second to none and is led by experienced, passionate tarpon guides. 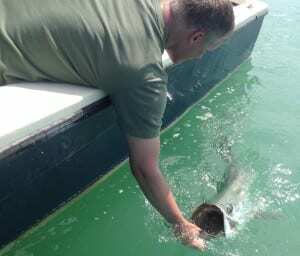 During the peak of the season, from late spring through summer, catching a giant tarpon is more common than not. Tarpon are thrilling fish to catch, leaping and running and giving Southwest Florida anglers a fight to remember. These flashing silver giants reach more than 200 pounds and are the biggest attraction for Captiva Island fishing guides. But, Southwest Florida fishing is great for all local sport fish species. Southwest Florida’s “big three”-redfish, snook, and speckled trout make for great year-round sport fishing targets. Captiva Island is well known for having the world’s best shelling beaches. Visitors and vacationers from around the world travel to Captiva to treasure hunt on its pristine, shell-covered beaches. The crystal waters of Captiva Island boast some of the most fertile grass flats in Florida and are home to a great number of bait fish and sport fish, as well as many other marine wildlife species. Dolphin, sea otter, sea turtles, and manatee call this island home and wildlife sighting off Captiva are a real thrill. In addition to the marine life, Captiva is home to a number of rare and endangered birds including bald eagles, spoonbills, egrets, herons, wood stork, owls, and woodpeckers. A guided fishing trip adventure on Captiva Island, Florida brings much more than just the thrills and excitement of its world-class fishing. Explore Captiva Island’s world class fishing, shelling, beaches, and wildlife by reserving a Catch Me If You Can fishing charter today. Quickly learn why exploring Captiva Island by boat is the best way to experience the best of Southwest Florida.